Hotels.com is a leading online accommodation booking website. 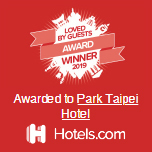 Park Taipei Hotel received “Loved by Guest Award” in 2019. It is a great honor for Park Taipei Hotel and thank all its supportive valued guests. We shall continue to strive for the best in providing quality service.